You can now improve your label inventory management while improving the look of your labels by using one of Epson new color ink jet label printers. Featuring a wide range of printers, Epson has the high-speed Epson C7500, C7500G and C7500GE for high-resolution labels, the Epson SecurColor C3400 & C3500 inkjet label printers for color-enhanced narrow-web labels and tags on demand, and the Epson ColorWorks GP-C831 wide-format inkjet label printer that is perfect for GHS-compliant large format drum and chemical labels. This industrial-strength label printer with tractor feeder is designed to handle the rigors of large-volume printing with fast print speeds, affordable high-capacity ink cartridges and exceptional reliability. 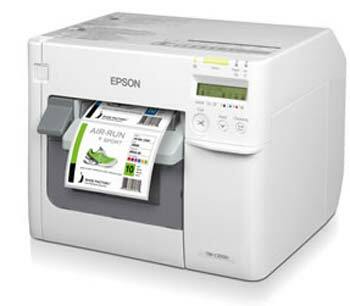 Epson inkjet label printers use durable pigment-based inks that firmly bind to media fibers, delivering outstanding stability and resistance to chemicals, water, fading and smudges. The Epson C7500 (basic) and the C7500GE (graphics edition) precision inkjet label printers area fast, full-color label printers whose rugged design allows minimal maintenance, low cost of ownership, and is ideal for busy, on-demand labeling environments. Now you can dramatically reduce color label costs, increase operational efficiencies and quickly produce high-quality color labels with Just-in-Time Color™ printing on Epson's high-speed ColorWorks C3500 Inkjet Label Printer. This compact inkjet printer is perfect for in-house on-demand printing of small GHS chemical labels, short run food labels, medical device labeling and more. 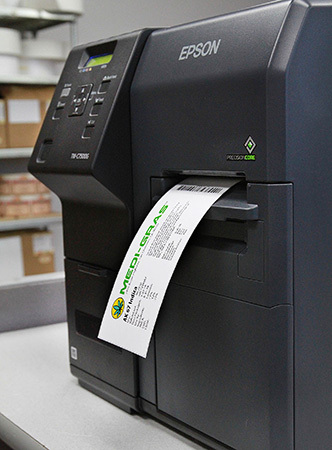 The high-quality C3400 prints color-enhanced labels and tags on demand to improve inventory organization, lowering the cost of inventory management and improving customer service. Prints labels from 1/2" to 4.4" wide at up to 720x360 dpi. 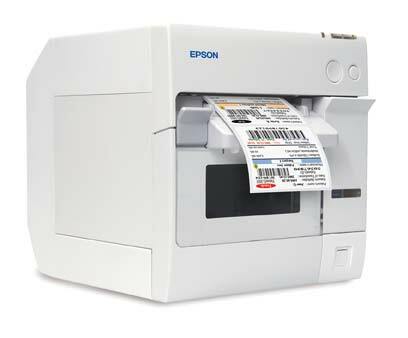 Epson's ColorWorks C831 breakthrough industrial-strength inkjet label printer is ideal for GHS large format drum and chemical labels. 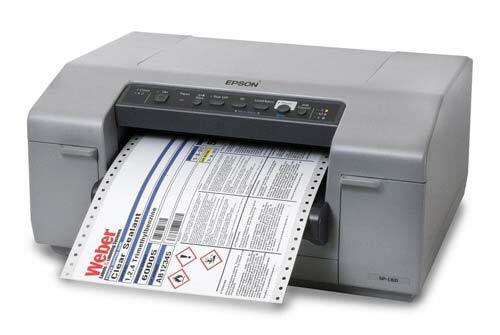 This wide-web printer uses pin-feed labels for extended accuracy and can print labels up to 8.8" x 22.0". This is the first inkjet label printer that has been BS5609 certified. 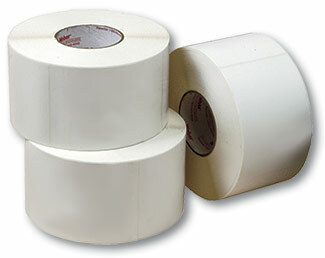 Go-Label offers a variety of labels for your Epson C3400, C3500, C7500, C7500G, and GP-C831 ink jet label printers. 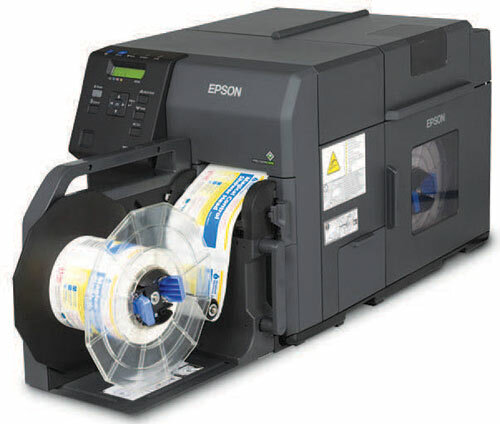 For the Epson most label printers, we have labels featuring a high-gloss or matte facestock specially engineered for use in these on-demand inkjet printer. The adhesive is a versatile, general purpose emulsion acrylic with excellent adhesion to corrugated and various plastics. 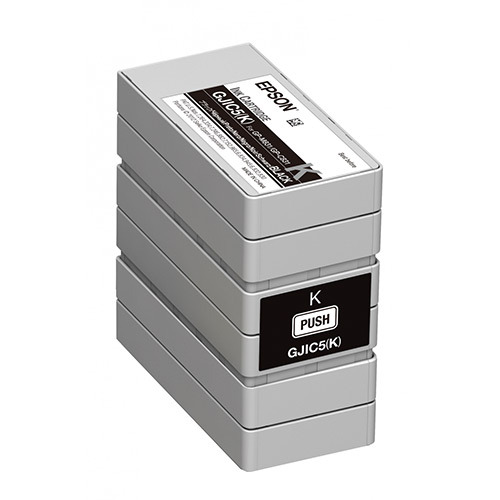 These labels are a perfect match for use in Epson's Ink Jet Label Printers. Choose from a wide variety of genuine Epson replacement ink jet cartridges made specifically for your Epson C3400, C3500, C7500 or GP-C831 label printer. These cartridges are specially made by Epson to give you the best performance from your inkjet label printer while still being economically sound.